K3/10 @ 5W to a 40M dipole or a 40M extended double Zepp. Only 3 states this time - but that was better than last month with 0 states (I forgot). Maybe my worst score. Conditions seemed 'fair' (one of the QSOs was with a 1W station), but not much activity. Best signals: 40M - W4VHH, 80M - AB9CA. Heard Don (K3RLL) on 80 but could not attract his attention. The best of the season to all from Nick, Elizabeth and Bella the Boxer (BB). May 2017 bring us better propagation. Had fun. 20M dead at the start. 40M very long at the start. Heard K7TQ, but Randy couldn't hear me callling him. Thought there should be a lot of activity on 80M, but that was not to be. W3KC just before 0300Z and W5ACM at about 5 minutes before the end. Called CQ SP for about one hour and 15 minutes with only the two calls. Took out time around 0300Z for the local CW traffic net and a QSO with my college roommate, K4QPL. Hope for better conditions and more activity next month. 73, John, K4BAI. I used my 1 Watter on 20 for the first 45 minutes. Six folks were able to work my 1 W in spite of what looked like poor solar numbers. Four were in TX, one in OK which was a two-way 1W, and one in IN. Pretty good for 1 W from ID. Switched to the big rig and 5W, K3, for 40 m and made 14 Qs with several two band folks. Tried 80 m, but heard nothing. FT1000MP, 5W, zepp, inverted V. Only operated the second hour this month. 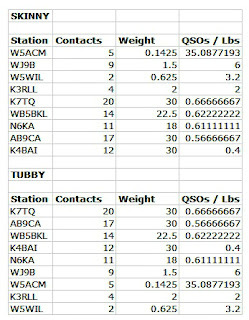 QSOs by band: 40: 8; 80: 4. Hope for more activity next month. 15M was dead here. 20M was almost dead and no answers to CQs and no sprinters heard on that band this month. 40 and 80 were both OK. 73/72, John, K4BAI. K3/10 @ 5W to a 20 wire delta loop, a 40M dipole or a 40M extended double Zepp. Got the K3 back in service. 9 states this time - and all signals seemed relatively weak with deep QSB. Best signals: 20M - WJ9B, 40M - NK6A, 80M - WA8ZBT. Also worked a Cuban, but did not include him in the total. I worked several Spartan Sprinters in the CWOpen on Saturday. My thanks to all. Had fun. I worked K4BAI and W5ACM on 20m and 40m. 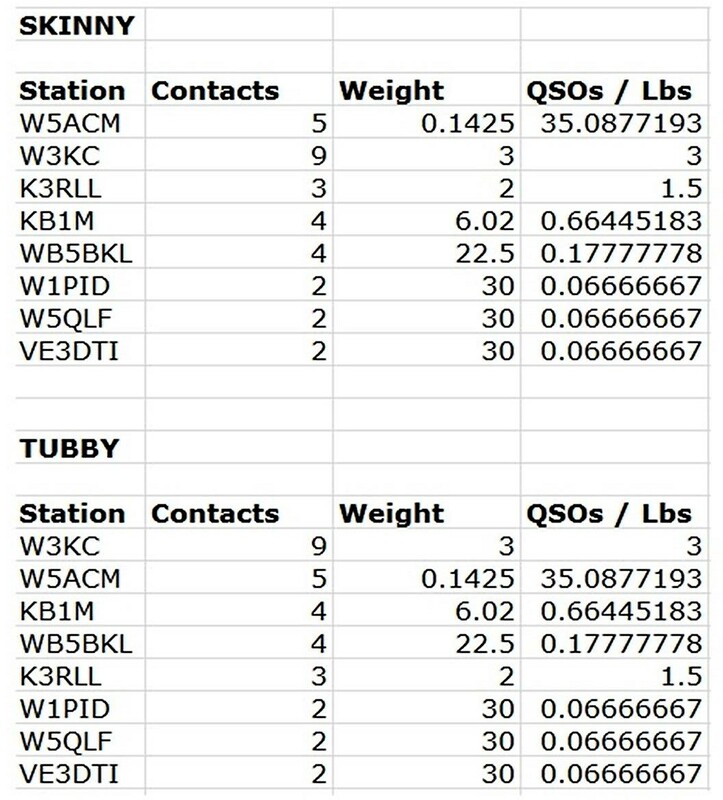 I worked WB5BKL on 20m, and he was my only contact on 80m. N5GW (MS) had a good 559 signal on 40m running only two watts. There was a net on 3560 khz so I searched around 3562 kHz where I found WB5BKL. This is my first Spartan Sprint in quite awhile, and first Sprint since moving from FL to ID in 2011. I need to use my Elecraft KX1 (20m/40m only), purchased and built years ago for use in Spartan Sprint....complete with batteries and internal antenna tuner. It is very light but only about 3 watts output. I was using the KX3 with internal bats and ATU to a CFZ. 20M yielded only a few mostly weak sigs. 40M was QRNish as to be expected in midsummer. I didn't try 80M. Participation seemed to be down again, with only a few regular ops around. Maybe FOBB wore everyone out. I went back into the mountains east of Moscow, ID where I had done FOBB the day before. Same rig, K2, and 20 m dipole at 40 feet between the pine trees plus a 20/40 m inverted Vee on a Jacklite pole. Not a lot of activity, but I did get four of the usual suspects, K4BAI, AB9CA, WB5BKL, and W5ACM on both 20 and 40. All the 20 m Qs were far to the east or TX as were the ones on 40. Bert, K6CSL, was loud from CA on 40, but I never did hear his exchange. 20 m was still open near the end, 0250Z, when I could hear K4BAI calling CQ. Catch you all next month. I once again used my MTR-5B with 9V battery and palm pico paddle. My battery after 2 sprints is barely 8V and might be time to retire it. Operating 3 W down to 2 W. 6 states. Thanks everyone for having good ears. Used a new-to-me K2 @ 5W to a 20 wire delta loop, a 40M dipole or a 40M extended double Zepp. I am still in 'newbie' mode with the K2 - and apologize for the fumbling. My score is worse than last month but better than the month before that. Nothing on 15M, 4 on 20M, 5 on 40M and 1 on 80M. 40% of my contacts were from Idaho! Only 6 states this time. Best signals: 20M - N3VKM, 40M - N5GW, 80M - WJ9B. I guess Gene had is 40M rotatable rhombic pointed toward the Texas hill country again this month. Nice to work several FOBB participants again Monday evening. My thanks to all (including the organizers). Had fun. After my surprise win in July's Skinny division, it was good to see W5ACM back to reclaim the skinny crown! I did shave some weight by switching to three AA-size Three contacts on 20m and then 6 on 40m over about 80 minutes. It was coast-to-coast from IA to CA, PA, GA, MA and more. No two-band contacts, but lots of regulars. Let's hope we can keep promoting this fun event. If you plan to operate the 2016 FOBB portable – in other words, from a field location – you’re invited to request a Bumblebee identification number. Instructions for obtaining a Bumblebee number are in the next section, below, headlined "Apply for a 2016 Flight of the Bumblebees Number." There is no limit to the number of Bumblebees. You may apply for, and receive, a Bee number at any time up to July 31 prior to the contest. · Contacts with Bumblebees generate a multiplier of three. 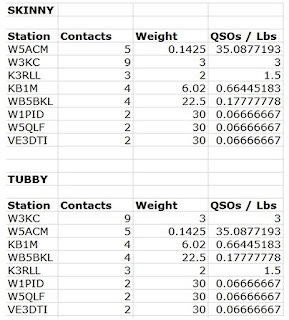 NOTE: If you worked NE6SW/BB on two bands, it counts as two Bumblebee contacts. 3. YOUR FOBB NUMBER ASSIGNMENT: Check the database, http://bit.ly/15aGgN1 after submitting your top three choices to see which number you have been assigned. The number listed in the database is your official 2016 FOBB number. 15M was open to the North East at the start. Only W2IX in NJ heard and worked. 20M was pretty good and 13 QSOs there from New England to Wis, to Ida, to Tx. 20 QSOs on 40M from New England to WI, MN, IA, ID, TX and NM and as close as FL and SC. Thanks for all QSOs. Hope everyone had a good Fourth of July. 73/72, John, K4BAI. Used KX3, Yagi & Rotatable Dipole QSB & noise on 40 made it tough. Missed at least a half dozen on 40. C U All again. his was my first time back in the Spartan Sprint in a while and it was great to be back. The MTR kept the weight way down but kept me off of 80 meters at the end. I got only K4BAI on 20m at the start (how many ears does he have!?) and the rest of my contacts were on 40m. The most patient award goes to K7TQ in ID and it was great to hear a few new to me callsigns. The band was very noisy here and it made we wish for a gain knob! Armed with an 817 and just under 1W of RF, I tried my first Spartan Sprint in a LONG time. There was a lot of QRN and some QSB, so not the best evening for weak signal work, but I managed to get 3 stations on 20m and 3 on 40m. Also heard a few others that I just couldn't pull out of the noise...maybe next time. Signals were low and noise was high, but special thanks to K4BAI in GA for sticking with me despite the conditions (and my stuttering fist). A good first half hour on 20 then slow rest of the time on 20 and 40. Both mobiles, NØEVH/M and AA5B/M, were loud. Got WB5BKL and K4BAI on both bands. Rig ATS3, Zmatch to 88' doublet up 65'. Started on 20m, found 5 stations by 9:30 PM EDT (0130Z), then broke for traffic net duty. After that, 20m seemed to be played out, and all I found on 40m were 13-Colonies stations who were only hearing QRO callers. No luck on 80m either. Thanks to those who participated on this holiday evening! FT1000MP, 5W, TH6DXX, dipole, zepp, inverted vee. 20M was fairly long with TX and western stations, plus K3RLL in FL. 40M was a bit noisy, but skip was short and was able to work as close as GA and FL and out to ME and CA. We could use more activity. 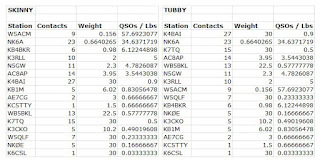 Almost every QSO was a chore and it would be more fun with more stations QRV. 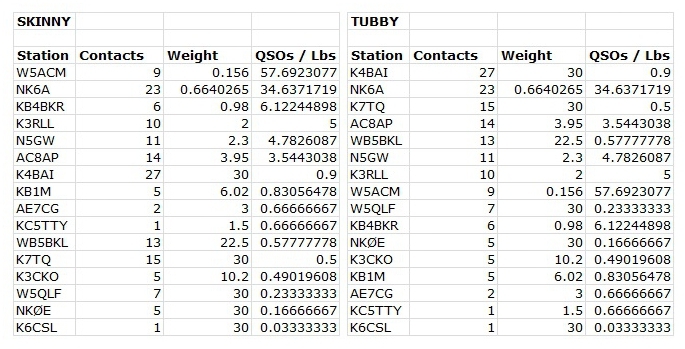 80M was OK with several QSOs in TX. 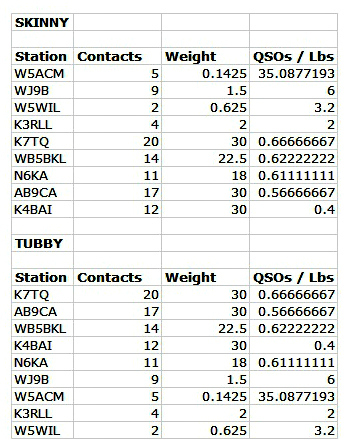 QSOs by band: 20M: 8. 40M: 15. 80M: 4. Looking forward to more activity next month. 73/72, John, K4BAI. Decided to operate with my newly built MTR-5B. Skinny category. Palm paddle and 9V battery, ear buds. Weight was just under 11 oz. The Reverse Beacon Network showed my getting out to NH and PA. Power was just under 3W on 20 and 3 W on 40. Quite happy with my results. A lot of good ears out there. Thanks. 9 states. Many Texans, MS, Ohio and GA. Although I was heard on the East Coast, I did not work anyone there. Very happy to have QSOs with W5ACM and NK6A. KX3 with internal bats and ATU to CFZ. 20M didn't sound all that good. 40M was noisy with summer QRN. Only one contact on 80M with K4BAI. Participation was down, I suppose due to vacation season. K3/10 @ 5W to a 20 wire delta loop, a 40M dipole or a 40M extended double Zepp. Better than last month - but not by much. 4 QSOs on 20m, 7 on 40 and 2 on 80. No triples this month. Most signals were weak and the bands seemed noisy here. Best signals: 20M - W7TAE, 40M - N5GW (at 2W! ), 80M - WA8ZBT. My thanks to all. Had fun.